Serving up award-winning barbecue since 2004. 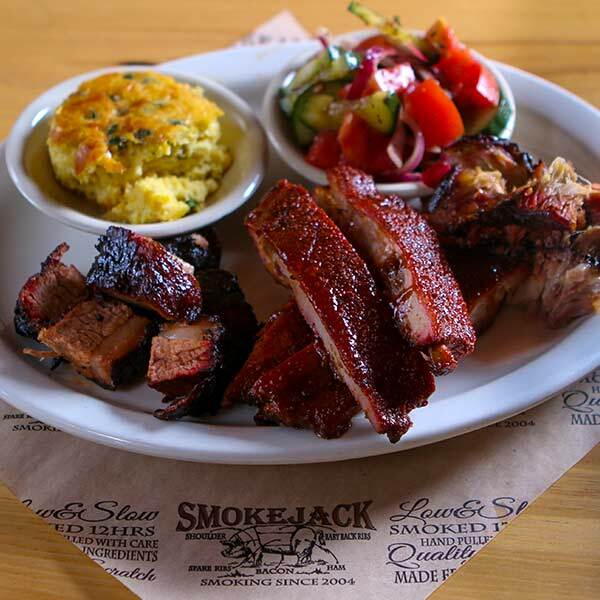 Smokejack BBQ is your home for award-winning, true southern-style cuisine. With a unique, comfortable, and convenient location in Alpharetta, our BBQ is made from scratch daily with only the freshest ingredients. Thanks to the folks at Atlanta Eats for featuring Smokejack BBQ in a recent video episode! With an eye on the future and feet firmly rooted in great Southern culinary traditions, Smokejack Southern Grill has been proudly serving the northern Atlanta suburbs since 2004. Smokejack is in the heart of historic Alpharetta, located in a charming 180-year old building that has served the community in a variety of ways. We’re just carrying on that great tradition. Our mission is to take fresh, high quality ingredients and prepare them with care and respect, resulting in unique and delicious food. And while we emphasize great barbeque, we play no favorites with the many regional styles. From slow smoked, hand-pulled pork to moist tender ribs to our signature beef burnt ends, we have something for all BBQ lovers.